the part of the metencephalon situated on the back of the brainstem, to which it is attached by three peduncles on each side (the cerebellar peduncles); it consists of a median lobe (vermis) and two lateral lobes (the cerebellar hemispheres). See also brain. The large posterior brain mass lying posterior (dorsal) to the pons and medulla and inferior to the tentorium cerebelli and posterior portion of the cerebrum; it consists of two lateral hemispheres united by a narrow middle portion, the vermis. 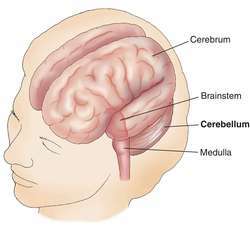 /cer·e·bel·lum/ (ser″ah-bel´um) the part of the metencephalon situated on the back of the brain stem, to which it is attached by three cerebellar peduncles on each side; it consists of a median lobe (vermis) and two lateral lobes (the hemispheres). the part of the brain located in the posterior cranial fossa behind the brainstem. It consists of two lateral cerebellar hemispheres, or lobes, and a middle section called the vermis. Three pairs of peduncles link it with the brainstem. Its functions are concerned primarily with coordinating voluntary muscular activity. The large posterior brain mass lying dorsal to the pons and medulla and ventral to the posterior portion of the cerebrum; it consists of two lateral hemispheres united by a narrow middle portion, the vermis. The smaller sub-brain lying below and behind the CEREBRUM. The cerebellum has long been thought to be concerned only with the coordination of information concerned with posture, balance and fine voluntary movement. Recent studies have shown, however, that the cerebellum functions to assist in many cognitive and perceptual processes. The cerebellum may also have a role to play in coordinating sensory input, and even in memory, attention and emotion. the anterior dorsal (and largest) part of the HINDBRAIN which controls balance, muscle tone and the coordination of voluntary muscle. It is best developed in birds and mammals; in the latter there is a cortex of grey matter and the surface is complexly folded. The folds are lined with PURKINJE CELLS. Removal of the cerebellum unbalances an animal and affects the accuracy of voluntary movements such as walking, swimming, knitting. n a major division of the brain, behind the cerebrum and above the pons and fourth ventricle, consisting of a median lobe, two lateral lobes, and major connections through pairs of peduncles to the cerebrum, pons, and medulla oblongata. It is connected with the auditory vestibular apparatus and the proprioceptive system of the body and hence is involved in maintenance of body equilibrium, orientation in space, and muscular coordination and tonus. the part of the metencephalon situated on the back of the brainstem, to which it is attached by three cerebellar peduncles on each side; it consists of a median lobe (vermis) and two lateral lobes (the hemispheres). Structures in the cerebellum include cingulum, cerebellar cortex, culmen, pyramid of cerebellum, uvula and vermis. See also brain. Q. can you recover after a cerebellar stroke? A. You can recover after a cerebellar stroke but the process takes time and rehabilitation. With the right kind of rehab people reach great results, supposing of course the initial injury allows it.